PRODUCT DESCRIPTION: Long reaching aerosol spray that can reach nests up to 20 feet away. Rapid knockdown and kill, it uses Tetramethrin as it's active ingredient. TARGET PESTS: Bees, hornets, yellow jackets and other wasps. WHERE TO USE IT: Outside around the home where nests form like under eaves, on telephone poles, building walls, decks, garages, etc. RATE OF APPLICATION: Target nests within range of the spray and treat nests in the evening after all occupants have returned for the night. Spray until the nest is soaked and leave it alone for at least one day. Do not attempt to remove the nest until you are certain all activity has ceased and the inhabiting insects are dead. I have large furry bees that hover. The back end of them is Black. when I go outside they are on the shingles and immediately rush to me. I quickly go back inside. I had a few run into my face yesterday. Did not get stung but ran into the house. They look like they are fighting with one another and act crazy. They hover like a helicopter and I think nesting inside the shingles of the outside of my house. How can I get rid of them? It sounds exactly like carpenter bees. I say this because male bees constantly hover looking for females and will routinely fly at people and one another. The good news is they don't have stingers so they can't hurt you. But females can sting and worse yet, drill through wood as they create nests. This drilling is not good for any structure and should be stopped. For this reason you need to kill their nests and spray to prevent new nests from forming. At this point I suggest you get some Drione Dust and treat up under the shingles where you see them entering. This will kill active nests and keep them from using any area you treat. Once this is done, let the treatment sit for a day and if you don't see any more going under the siding, spray with Cypermethrin to keep them away from all other areas. Of course you can dust as many areas as you want with Drione but in general, its used to treat existing nests and passageways with the Cypermethrin being sprayed to keep them from coming back. And here are links to the dust and spray. I HAVE CICADA KILLERS AS WELL. WHAT PRODUCT WORKS TO KILL THEM AND THE NEST. If you review our Cicada Killer article, you'll learn there are two approaches and products we recommend. If you prefer the liquid approach, go with Cypermethrin and Spreader Sticker using 1/2 gallon of mixed material per hole. But the Drione Dust is arguably faster and easier to use and what I prefer to apply when treating nests directly. I have a large bald face hornet nest attached to a tree. The product warning says "DO NOT USE THIS PRODUCT ON LIVING DECORATIVE TREES, SHRUBS OR ORNAMENTAL PLANTS." Can it damage the tree? It can. Basically this spray has a large amount of oil which is "penetrating" by nature. When applied to the foliage of most any ground cover or tree (specifically the leaves of the tree) it will invade the tissue and ultimately cause damage. If said damage doesn't happen when first applied, it will probably happen indirectly once allowed to sit on the foliage during the heat of the day. To prevent this from happening you can try to target just the nest and avoid spraying the soft green foliage. You can also hose down the plants after spraying which will usually help. Especially if you treat in the evening as the sun is nearing sunset. Lastly, you could opt to go with a liquid option like Optigard Flex. Spraying this all over the nest will cause no problem for the tree. Now it won't work quickly but this is very much by design. Basically the active will take 3-4 days to kick in but it works via "transference" which means any member of the colony which touches it will in turn transfer some to other members of the colony. The net result is that when it does kick in and become active, it will kill the entire nest. Please tell me the best product to use to get rid of bees. I believe they are carpenter bees. We have a pool with small children and they literally terrorize all of us when we go outside. I'm so frustrated and mad because I've done every Eco-Friendly and/or home remedy to deter them or stop coming to our yard and NOTHING HAS WORKED! Are they flying at you or landing in the pool water? Carpenter bees are quite active and male bees will definitely be aggressive. So to keep them away you need to find the plants they're targeting and spray them with either NBS or Cypermethrin. This in turn will keep away females so the males will leave too. Now if they are flying around the pool to collect water, you'll need to use some Killet. This is essentially an algaecide and when added to pool water, will make it so bees or wasps can't extract water anymore so they'll stay away. I have been having a problem with Cicada Killers in my yard for several years. I have tried everything. I have been using this on the males if I can catch them sitting still long enough. I have been able to kill a few. This works Bold faced hornets! Baled faced hornets put a nest 24 inches off the ground on a fence. 3 different kinds of spray from the local stores did NOTHING. The spray from these folks worked and killed the whole nest. I do not like spraying and in fact have used only one can of spray in 10 years. When you absolutely have no choice though you need something that works. This does. 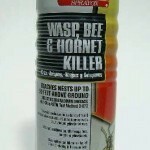 This hornet killer seems to work better than most. It has an oily smell which kills them faster. Only downside was one of the cans ran out of propellant before the can was empty. Finally a Hornet Killer that just works. Previous experience with big box store spray cans never worked well nor met the advertised claims. Will this work on giant European hornets? Most definitely. Its super strong and will handle any of the big wasps and hornets (see comments above).